I think I’m officially a jaded cynic because ME, the girl who once had a notebook boasting “I’m in love with places I’ve never been to and people I’ve never met” (#cringe) is now rolling her eyes at the majority of travel quotes floating around on the Internet. I’m not sure if it’s simply overuse (I blame you, relentless IG captions), but a lot of quotes I see these days really make my skin crawl… Haunting me from my Pinterest boards, creeping into my Instagram and my personal favourite – printed on pillows at the local Urban Outfitters. Despite the hate though, I have to admit: there’s nothing quite like a good travel quote to fire up the inspiration and get that warm “yassss” feeling back into my jaded bones. Full disclosure, I DO keep a secret folder full of snippets and travel quotes that inspire me, and I want to share them with you today. Here is a full list of my favourite travel quotes, with hopefully some that are less common and less uhm… “live laugh love”, yenno? 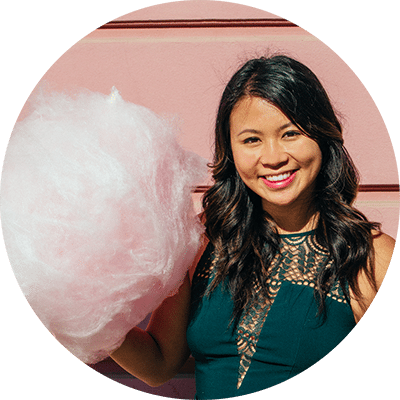 Speaking of cheesy Pinterest graphics, this post is FULL of them! Hover above the images you like to quickly pin them to all your dream boards 😉 No judgment. 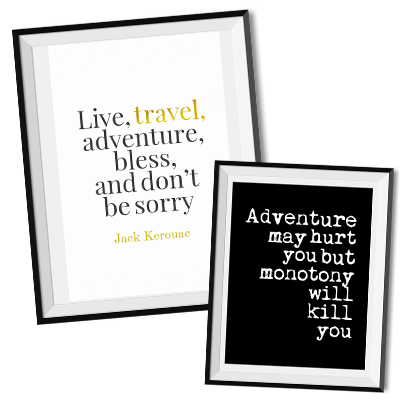 Get these beautiful printable posters for free! Of all the travel quotes floating around the interwebs, these are my personal favourites that really nail the emotions and joy I link to travel. Many will (hopefully) be travel sayings you haven’t heard before. I hope you like them as much as I do! These travel sayings are here to get you FIRED UP! Enjoy my favourite travel quotes that will make you feel all empowered and stuff. The following travel sayings keep it short and ultra-quotable. Think of them as a limitless bank of great travel captions for Instagram 😉 Best accompanied with a vaguely related emoji. 78. “Everyone needs someone who will call and say ‘get dressed, we’re going on an adventure'”. A lot of travel sayings out there are short and snappy, but sometimes I love digging into longer travel quotes that are eloquently phrased and perfectly nail an emotion I or thought I’m not able to describe myself. The following are some of my favourite long travel quotes. Sure they don’t fit on a T-Shirt, but dayum they’re great to read! 82. “Go outside. Don’t tell anyone and don’t bring your phone. Start walking and keep walking until you no longer know the road like the palm of your hand, because we walk the same roads day in and day out, to the bus and back home and we cease to see. We walk in our sleep and teach our muscles to work without thinking and I dare you to walk where you have not yet walked and I dare you to notice. Don’t try to get anything out of it, because you won’t. Don’t try to make use of it, because you can’t. And that’s the point. Just walk, see, sit down if you like. And be. Just be, whatever you are with whatever you have, and realise that that is enough to be happy. I felt like these three travel quotes needed a category of their own. I just love the way they capture the wonder/joy of travel! Do you agree? Okay, and now, last but not least, I bring you THE most over-used travel quotes of all time. Some of them honestly make my skin crawl, but hey, I can admit they’re pretty darn inspirational (and of course, I couldn’t do a travel quotes roundup without them). Just try to imagine them out of their typical context of inspirational mugs or T-shirts and you’ll be fine. I hope you enjoyed that epic roundup of my favourite travel quotes! Now your turn – drop me a comment if I’ve left out any of your favourites. Just enter your email and you'll gain access to my special VIP zone, featuring freebies like these printable posters!